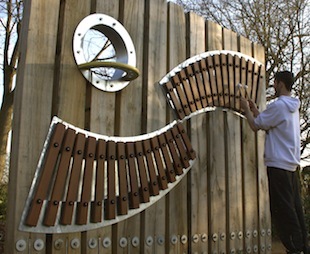 Award-winning bespoke musical installations and interactives for public spaces, playgrounds, sensory gardens and museums. Acoustic Arts are specialists in the design and manufacture of musical installations. The team of musicians, artists and teachers have created world class musical sculptures to delight children and adults alike. A range of outdoor musical instruments for schools, nurseries, parks and playgrounds available from the Playground Percussion catalogue. Acoustic Arts' playground instruments have been much copied but rarely bettered. With a design team that includes teachers, artists, professional drummers and musicians, Acoustic Arts has created a range of accessible, tuned instruments of the highest quality that sells to schools around the world. 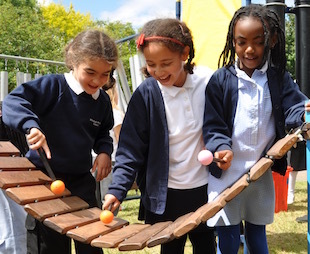 A unique musical playground built from recycled materials for hire at festivals, family events and schools. 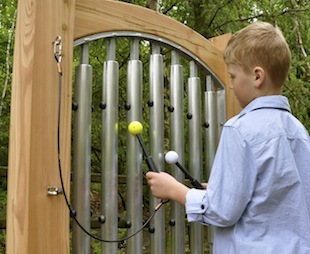 Over the last 15 years the Music Maze has toured the UK and mainland Europe where its fun, accessible instruments have wowed visitors of all ages and abilities. For full details visit the main website or contact Acoustic Arts today!